Here’s the thing, if I’m going to make the effort to can I like to make a huge batch to make my efforts worth it, because it doesn’t take any longer to do so. But it does save me the time of making a second batch later. But, you need a really large stock pot. The best deal I’ve found for a huge stock pot for large batches is the 20 Quart ExcelSteel Stainless Steel Stock Pot. 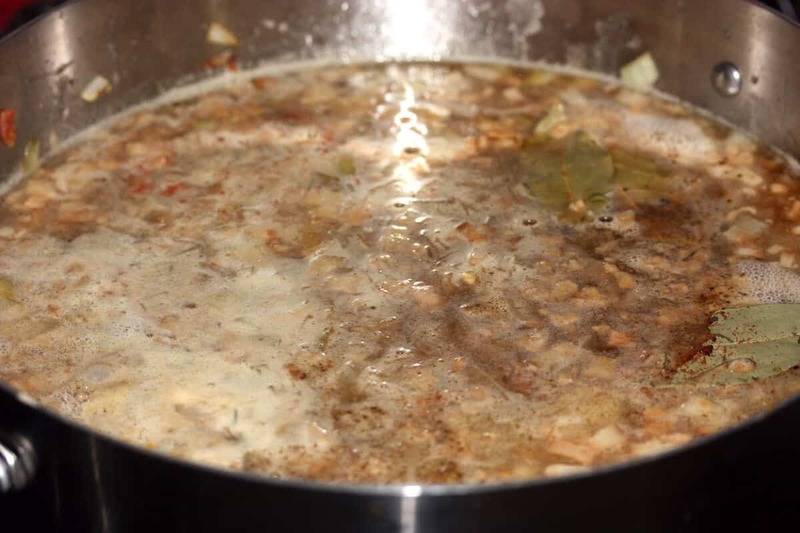 It holds a ton and that way you can fit large quantities without it boiling over or splashing. I purchased this right after making these beans because I was so frustrated with even my largest stock pot not having enough room. It’s made my canning life much simpler. I use and like my huge Presto 23-quart Pressure Canner and Cooker because it allows me to make large batches. **Make sure you’re getting a pressure canner. You can’t do any canning with a pressure cooker. A canning kit is also extremely helpful to have. The funnel and kitchen tongs are essential. Rinse the beans and rapidly boil them in unsalted water for 2 minutes. Then turn off the heat, cover and let soak for 1 hour. Drain and discard the liquid. 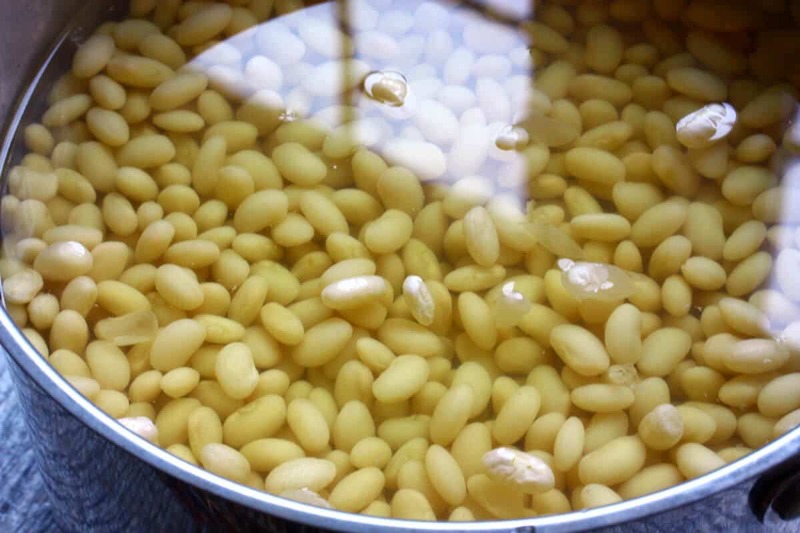 Return the beans to the pot with 6.75 quarts of water and bring to a boil, the immediately drain again – this time reserving the liquid. Set aside the beans and liquid. 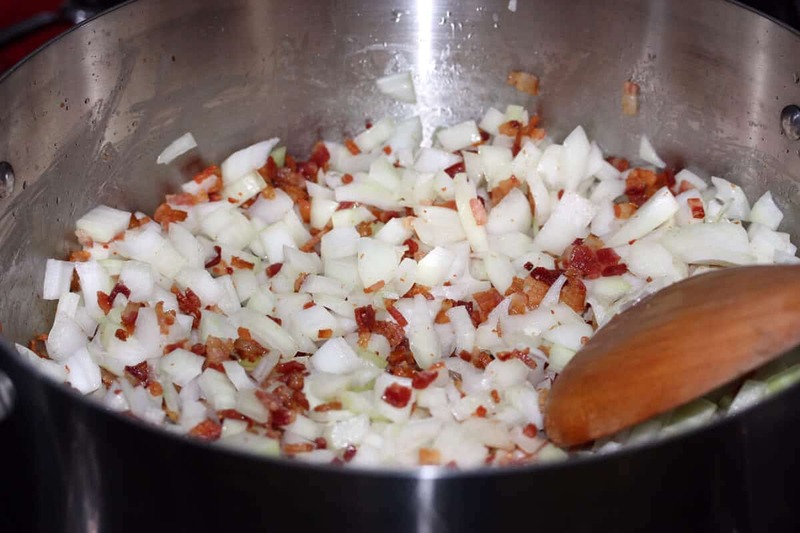 In a very large stock pot (at least a 10-quart pot) fry the bacon until crispy then drain the fat. Draining the fat is essential for the bottles to seal when you pressure can them. Add the onions and cook until soft and translucent. Add the garlic and cook for another couple of minutes. Add all remaining ingredients, including the beans and their liquid. You have two options for cooking the beans: 1) Cover and bake at 350 degrees F for 3-4 hours, stirring once or twice. If needed, add a little water while cooking to keep the beans “soupy”. (Be sure to use an oven-safe lid or cover tightly with foil), or 2) Cover and simmer on low-medium on the stovetop for 60-90 minutes or until the beans are soft (depending on how old the beans are they may require longer). Keep in mind though that the beans will continue to cook in the pressure canner so don’t let them get mushy. I recommend at least a 10 quart stock pot. Mine was 8 quarts and as you can see it’s nearly filled to the brim! 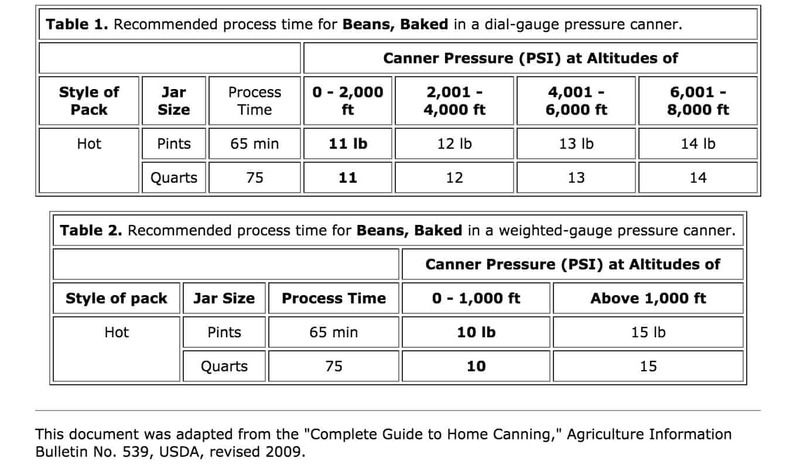 Per your canner’s instructions, remove pressure canner from heat and allow the pressure to release on its own. Remove jars and place them on a kitchen towel on the counter top and let them sit undisturbed for 24 hours. Jars are sealed when the jar lids are depressed. For best storage, store in a dark and relatively cool place (though room temperature is fine). Shelf life is at least 1 year. Rinse the beans and rapidly boil them in unsalted water for 2 minutes. Then turn off the heat, cover and let soak for 1 hour. Drain and discard the liquid. Return the beans to the pot with 6.75 quarts of water and bring to a boil, the immediately drain again - this time reserving the liquid. Set aside the beans and liquid. 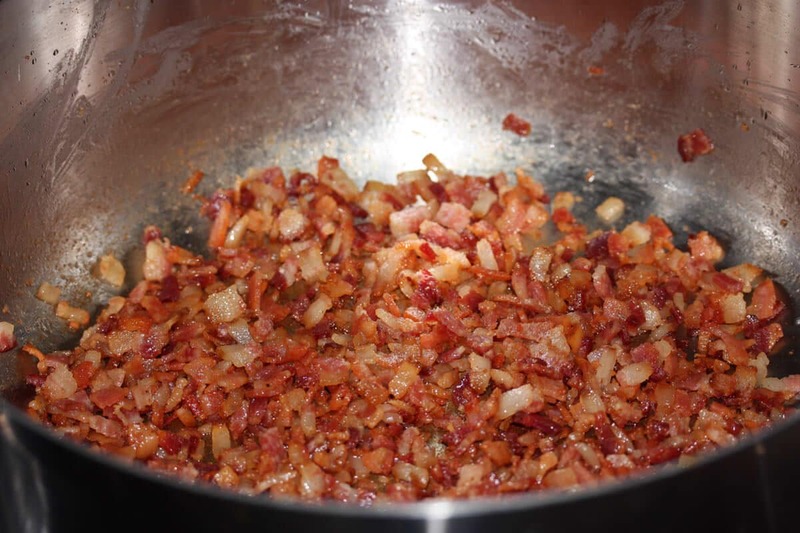 In a very large stock pot (at least a 10-quart pot) fry the bacon until crispy then drain the fat. Draining the fat is essential for the bottles to seal when you pressure can them. Add the onions and cook until soft and translucent. Add the garlic and cook for another couple of minutes. Add all remaining ingredients, including the beans and their liquid. You have two options for cooking the beans: 1) Cover and bake at 350 degrees F for 3-4 hours, stirring once or twice. If needed, add a little water while cooking to keep the beans "soupy". (Be sure to use an oven-safe lid or cover tightly with foil), or 2) Cover and simmer on low-medium on the stovetop for 60-90 minutes or until the beans are soft (depending on how old the beans are they may require longer). Keep in mind though that the beans will continue to cook in the pressure canner so don't let them get mushy. Per your canner's instructions (I use the Presto 23-quart pressure canner), remove pressure canner from heat and allow the pressure to release on its own. Remove jars and place them on a kitchen towel on the counter top and let them sit undisturbed for 24 hours. Jars are sealed when the jar lids are depressed. Makes 7½ quarts or 15 pints. 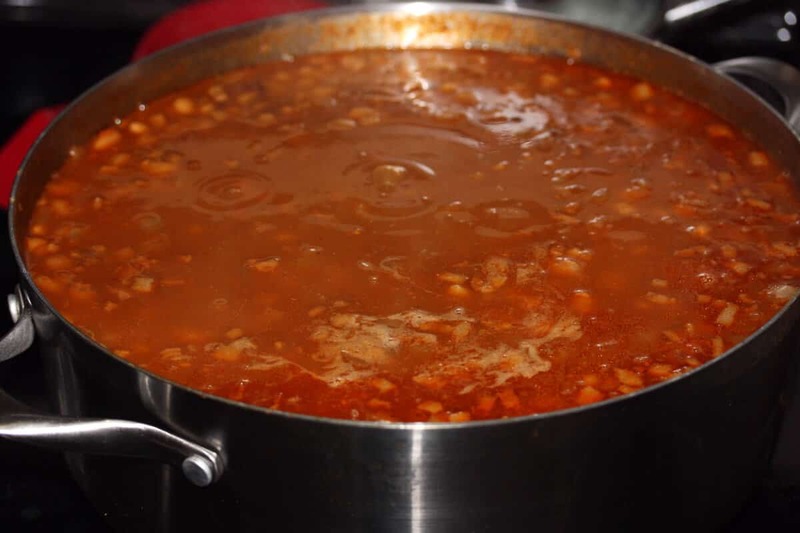 If you want to make "pork and beans" instead, simply reduce the amount of brown to a ¼-1/3 cup and either eliminate or only add a little molasses. You still have the option of cooking the beans on the stove or baking in the oven. Canning is just perfect thing to do, for preserve favorites and also for gifting. Thanks for sharing your tips on successful canning. This is great! I miss canning, I used to do it a lot. I’ve been wanting to get a canned forever but I haven’t made the plunge yet! Love reading about poeple that use them! I bet that these Baked Beans are so good!! Can you believe I’ve never used a presser cooker (or canner) before? I’d love to be able to can a huge batch of beans like this – they sound delicious! Thanks for sharing. I love boston baked beans, but have never thought to can them so I can have them on hand. I just got a pressure cooker for Christmas, and am thinking I will have to try this! I loves me some beans in just about any form. For as much canning as I do, I’ve never used a pressure canner. I’d love to have a bunch of jars of these beans in the pantry! My husband loves baked beans! These would be perfect for him! Hi Sonya, the times I gave are correct. I just added the diagram from the National Center for Home Food Preservation in this post, you can have a look. if you cook them on the stove 3-4 hours then pressure can won’t that be a little to much. Can you let them cook for an hour and then can to prevent over cooking. Hi Preacher, they maintain their shape well and are not overcooked. You can definitely try it for less time initially if you like and then check the texture after it’s canned to see if you prefer it that way. 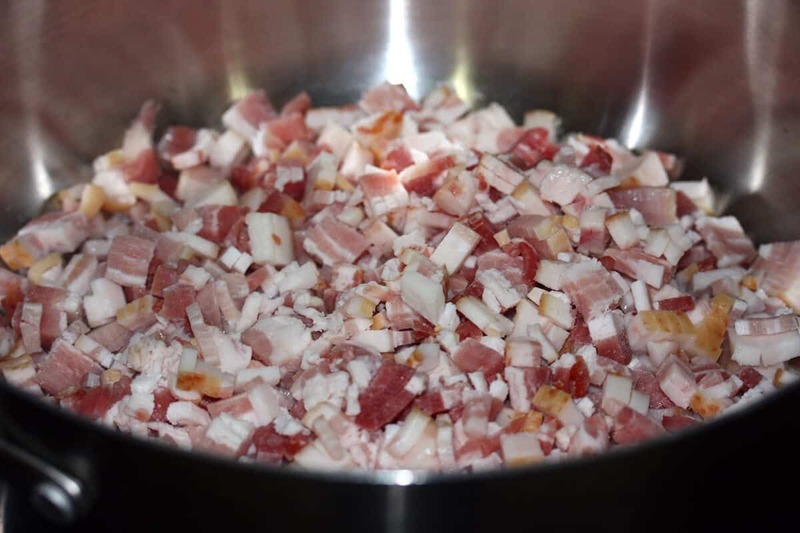 Can lean ground chuck be used instead og bacon. Hi Barbara, yes, you can substitute that for the bacon. Absolutely delicious! It’s amazing I had any left to actually can after my family dove into it, lol :) I’ll be making another batch for canning this week. can I use black beans for this? I’ve never seen black beans used for this, Louise, though I don’t see why you couldn’t. It will obviously totally alter the color (possibly the texture and flavor, I’m not sure) but if that doesn’t bother you go ahead and give it a try. Do baked beans have to be pressure canned? or can they be water bath processed ?? Hi Linda, they absolutely must be pressure canned or they will not be safe to eat. 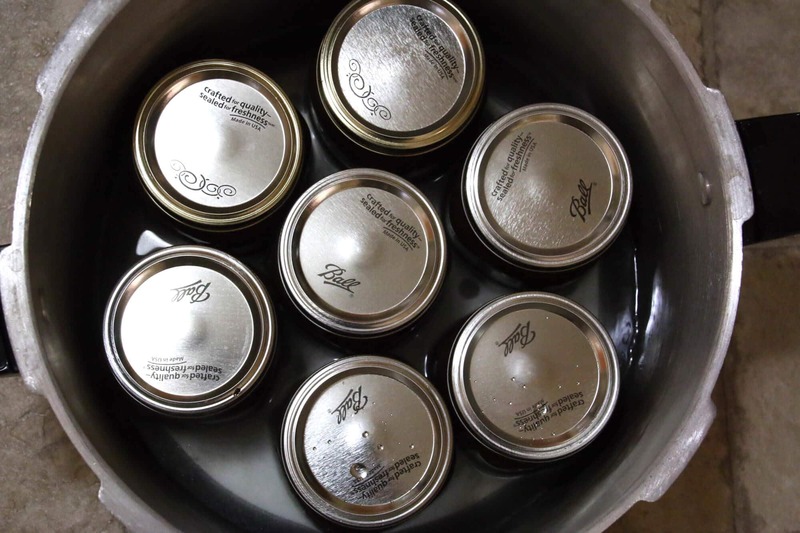 Do you cover jars with water in pressure canner? No, you do not. Every pressure canner will have its own set of instructions and will tell you how many quarts of water to add. You can download instruction manuals online for practically every model, new or old. 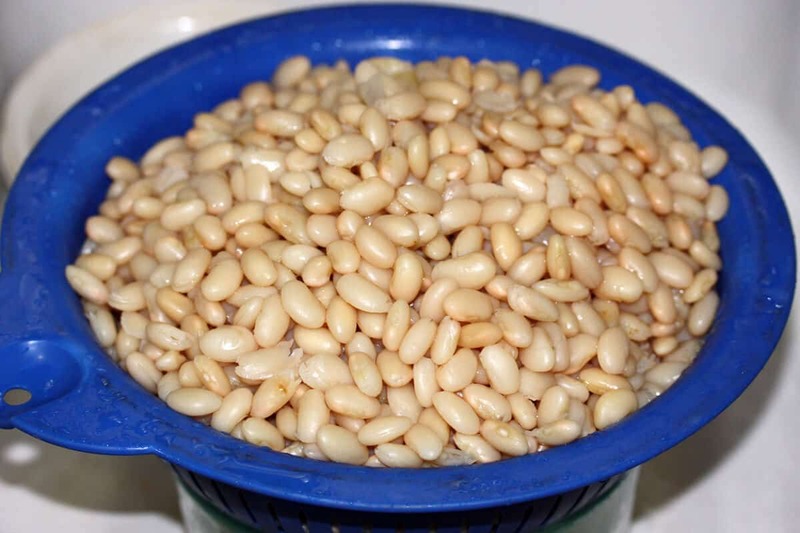 Can I used canned northern beans, instead of dried beans? Hi Tom, if you’re not going to can the baked beans, yes. But if you’re going to can them in a pressure canner use dried beans otherwise the texture of the beans will be mushy. Is this a tested recipe? Hello, by adding the meat should you pressure cook it 90 minutes? Hi Gert, no, the pressure cooking time remains the same. Do you have to use meat? I.e can you make without bacon or salt pork ? Hi Steph, you don’t have to use meat, simply omit it. I make my baked beans in an instant pot do I change the cooking time because it continues to cook when pressure canning. Hi Rita, you’ll still want to cook the beans until they’re soft but not so soft that they’re mushy. Are these qtys. Correct? This came out like soup. Way too much liquid. To be canned, it has to be far soupier than actual baked beans are. Heat can’t sterilize through extra dense food at home canning temps. 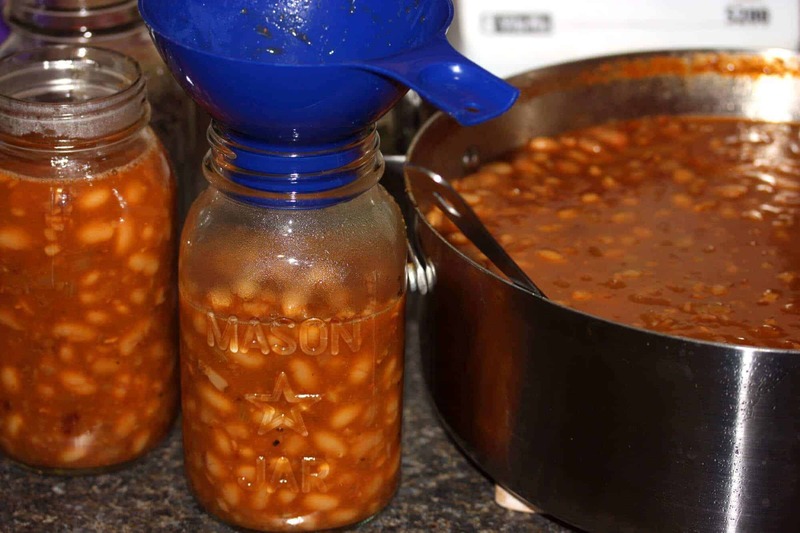 You’d be at risk for botulism for true Boston baked beans. National Center for Home Food Preservation states in their recipe it must be “soupy.” What I’m wondering about is the amount of meat in here – which must process longer than beans, 75 min for pint, 90 min for quart. I thought rule was you process for whatever component required the longest time: there’s a lot of meat in here compared to the NCHFP recipe, but times are same. Can I use the 4oz jars for this recipe? How much would this reduce the time required in the pressure canner? I like to can “sample sizes” of various recipes, then put several in a basket to give out as gifts to family and friends. I hand write the recipes on decorative cards to include in the basket. Everyone always enjoys them. I can bean but can them dry add the onions to hot tomato sauce and can for same amount of time. No need for a huge stock pot. Works great. Thanks for the extra spices I’ll try that. Thanks for the tip, Laurie, I’ll have to try that! Can you halve this recipe? It might be too much for ouR FAMILY.